As competitors rely on promotional-driven strategies in a fickle economy, Applebee's Neighborhood Grill & Bar is making a $75 million bet that a menu relaunch will boost weak sales. Today, the country's largest casual dining chain lights up 2,000 new wood-fired grills for a revamped menu with steaks that Applebee's hand-cuts on the premises. Amid the barrage of price-driven industry promotions, Applebee's thinks its upgrade to USDA Choice beef, along with the stacks of logs outside restaurants and the aroma of wood smoke inside, will pique consumer interest. That's something the chain needs right now: In the last fiscal financial year, same-restaurant sales were flat, and this year, Applebee's expects sales to range from a negative 2 percent drop to a 2 percent gain. "In the sea of sameness out there, this is an opportunity to really differentiate ourselves. We're changing not only the flavor of all of our food items, we can change the way people think about Applebee's," said Julia Stewart, the president of Applebee's who is also chairman and CEO of parent company DineEquity, Inc. The new grills will impact 40 percent of the restaurant's menu items, including chicken, salmon, pork and vegetables. To sell consumers on the significance of the change, Applebee's is breaking its most aggressive advertising campaign to date. Using both traditional broadcast media, as well as digital, mobile and social, the initiative bucks the industry's LTO model, where 'limited time offers' are promoted for eight to 12 weeks. Instead, Applebee's ad blitz will continue until the end of the year. "We're breaking the paradigm to use a more holistic approach in rebuilding our culinary expertise as opposed to sponsoring limited promotions," explained Darin Dugan, svp of marketing. That means no fast-paced spots to show off current menu specials. 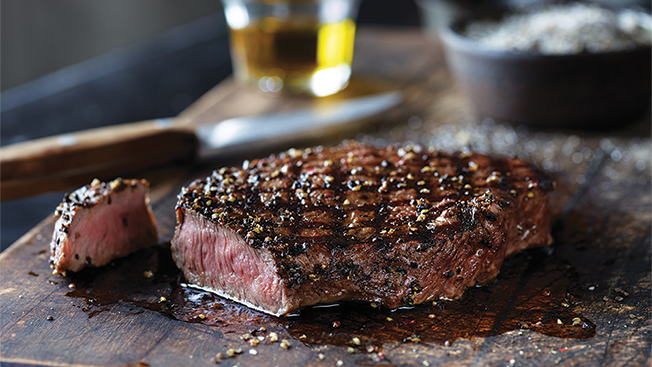 The chain's new wood-fired steak stars in ads from new agency Barkley, Kansas City. In one spot, the camera pans from a stovetop of grilling meat to the logs underneath, with the voiceover asking, "So does this look like a microwave to you?" Barkley ECD Jason Elm explained the raionale behind the straight-forward execution: "We eschewed all the tricks of the trade: No choppy edits, no overhyped voiceover, no impossibly aspirational millennials clinking glasses. Addressing the microwave misperception head-on in the copy shows the confidence and honesty this category needs." Applebee's has invested $75 million in the chain's relaunch, which includes ad spending, in addition to employee training—some 60,000 hours worth on the meat cutters alone—and new equipment. Recently the chain has been spending around $165 million annually on media advertising, according to Kantar Media. Stewart, a former Taco Bell exec, said rivals quickly copied past Applebee's marketing breakthroughs like the introduction of "2 for 20" promotions and a Weight Watchers menu. With this effort, she said the new positioning brings brand authenticity to Applebee's in a category that is dominated by independent restaurant operators. "The things we are about to do will be very difficult for anyone to copy," she said. "We want to distinguish ourselves and take back the neighborhood and bring the notion of family and friends back to the restaurant."